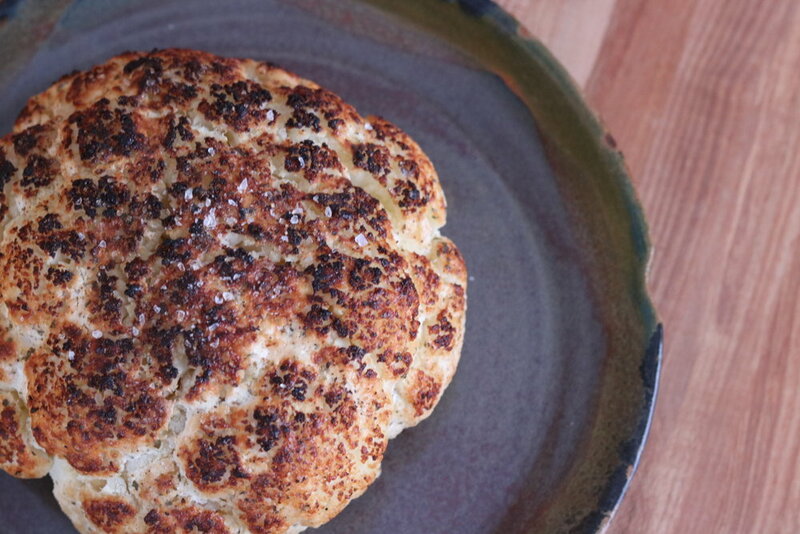 I love roasting a whole head of cauliflower — especially in the warmer months when I can use my grill. I roll it up in some foil, throw it on there and for the most part, forget about it. It is a no-fuss way to make a delicious side dish for dinner. Plus the leftovers are a great addition to pasta, breakfast scrambles and soups throughout the week! 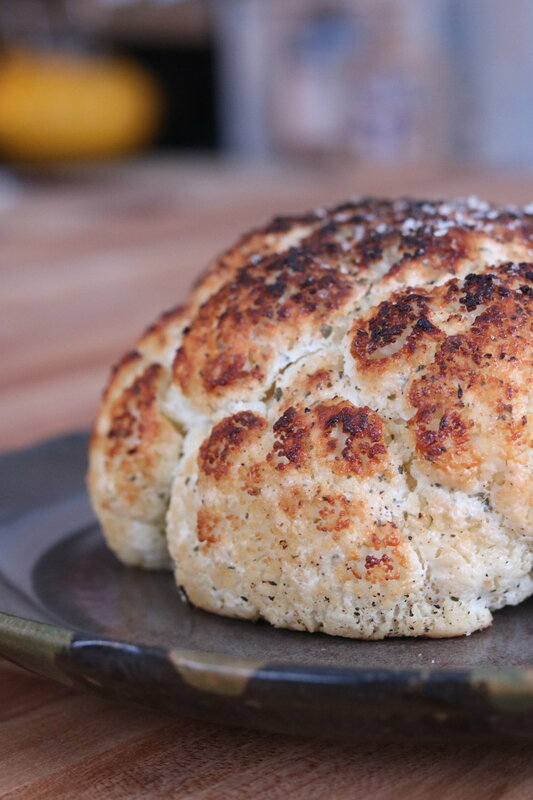 January in Minnesota is pretty frigid so this recipes shows you how to make the Roasted Ranch Cauliflower in your oven. Plus you can use the boiling trick to cut some major time off of cooking. Just bring 1 inch of water to boil and place the head of cauliflower bottom down in it for 10 minutes. Takes 40 to 50 minutes off the time in the oven! This would be great paired with a steak dinner or bacon-wrapped chicken breasts. The fresh lemon juice brightens up the savory flavors of the Ranch dressing while the Greek yogurt helps in making sure everything is evenly marinated and cooked. It is so easy and I love having the 40 minutes of roasting time to get the rest of my dinner ready to go. In large pot, bring 1 inch of water to boil. Clean and trim cauliflower, leaving enough core to hold cauliflower head together. Place cauliflower bottom down in boiling water for 10 minutes. In large bowl, mix ghee/olive oil, ranch dressing and lemon juice. Gently place cauliflower top down in the bowl, slowly moving it around to coat entire top with yogurt mixture. Using a spoon, add more yogurt into the spaces between the florets. Turn right side up and spread remaining yogurt mix into cauliflower. Cover with a pinch or two of salt and pepper. Place cauliflower on baking sheet with wax paper underneath. Bake for 40 minutes. Turn broiler on high and continue cooking until cauliflower is golden brown, about five minutes. Use a knife to check the thickest part of the cauliflower (the core) by slicing it in half. Knife should cut the cauliflower smoothly.